Do you remember the days when there weren't any CompactFlash Springboard modules available for the Visor? Me neither. 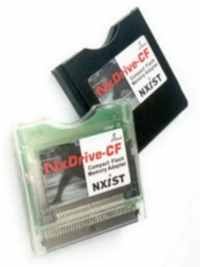 NXiST has developed the NxDrive-CF, the first certified CompactFlash module. This is the first CF module to have flash memory, allowing the backup and file management software to be stored on the NxDrive instead of the Visor. The software can also be updated in the future. Another nice feature of the NxDrive is that you can hotswap CF memory while the module is still in the Visor. The NxDrive-CF is $49 and is available in Ice or Graphite colors. NXiST also has available a Dual HotSync cable that connects to either a USB or serial port.